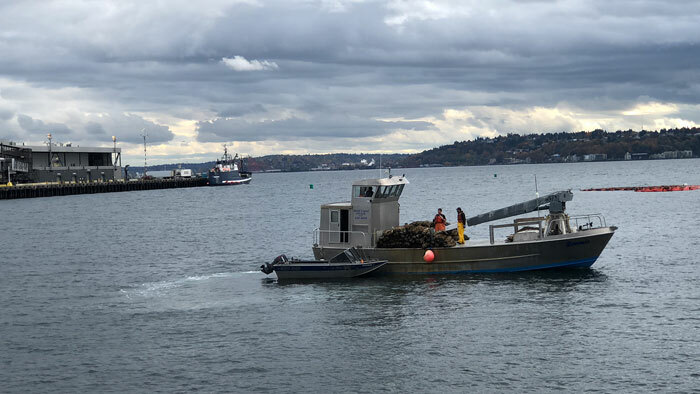 Photos courtesy of Port of Seattle Environmental Staff: More than three tons of Olympia oysters were seeded in Elliott Bay, near Smith Cove Park, in late October as part of the Blue Carbon Pilot Project. The pilot project is being carried out by the Port of Seattle, state Department of Natural Resources and Puget Sound Restoration Fund. Plans are for there to eventually be one million oysters as part of the pilot, filtering nearly 50 million gallons of water per day. Port of Seattle Commissioner Fred Felleman is excited by the multiple benefits introducing native Olympia oysters in Elliott Bay will have for the Puget Sound ecosystem, and the potential to expand the Blue Carbon Pilot Project exponentially in the near future. Through a partnership with the Puget Sound Restoration Fund and state Department of Natural Resources, the port seeded a project site between Smith Cove Park, the Elliott Bay Marina and Pier 91 with more than three tons of Olympia oysters on Oct. 30. The seeding took place about 150 feet from the shore. 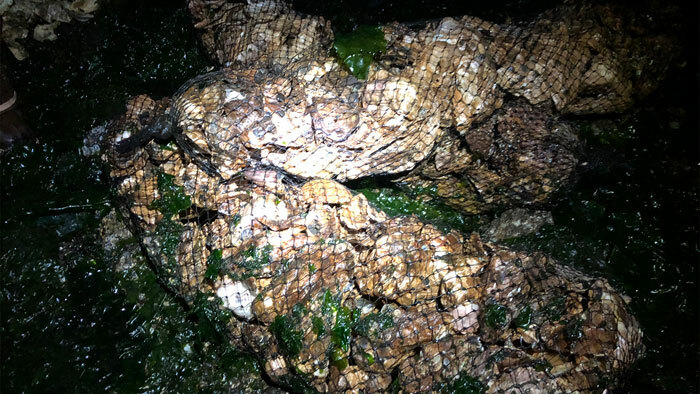 A boat dropped bags of oysters into the bay on Monday, Oct. 29, and early the next morning they were torn open and the oysters were spread out in a crescent shape between Pier 91 and the marina, Sloan said. Those oysters can filter two gallons of water per hour, trapping contaminants from stormwater runoff, metals from the bottom of boats in Elliott Bay and drainage coming down from Magnolia. Blue carbon refers to any vegetation near a shore area, as well as shellfish, that can catch and store carbon from the atmosphere. 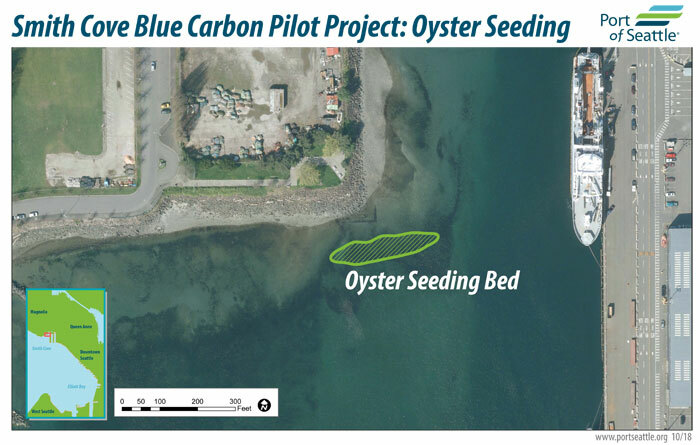 The Blue Carbon Pilot Project includes planting salt marsh vegetation, eelgrass meadows and kelp beds, which also assist in carbon sequestration, and create habitat for salmon and herring, Felleman said. Those plantings are expected to occur later this year and in early 2019. The commissioner said not only is the project restoring native Olympia oysters, which were almost wiped out 100 years ago, but the oysters are in return helping to reduce carbon acidification in the Puget Sound. Unlike other types of oysters in the Puget Sound, Sloan said, Olympia oysters reproduce naturally. While the current project covers about a quarter acre, the expectation is to eventually have one million oysters spread across more than an acre, filtering nearly 50 million gallons of water per day. At their absorption rate, Sloan said a 25-acre oyster bed could filter all of Elliott Bay, which is the ultimate goal, according to Felleman. The port has the advantage over private industries of being able to make long-term investments that can take decades to see substantial returns, Felleman said. Felleman said he led the creation of the port’s Energy and Sustainability Committee when he joined the commission in 2016, at which point $200,000 was authorized for the pilot project. He has a Master of Science in fisheries biology from the University of Washington, and studied the feeding ecology of Southern Resident orcas there. On top of the environmental benefits, Felleman said the project creates jobs restoring and cleaning up marine habitat. The commissioner added he’s hopeful more youth can be engaged and encouraged to seek employment in the marine industry. Sloan said oysters will periodically be collected and ground up, so the accumulation of contaminants and sediment can be studied. The Washington State Department of Fish and Wildlife has been doing something similar with its Puget Sound Mussel Monitoring Program, which includes a site near Pier 90. 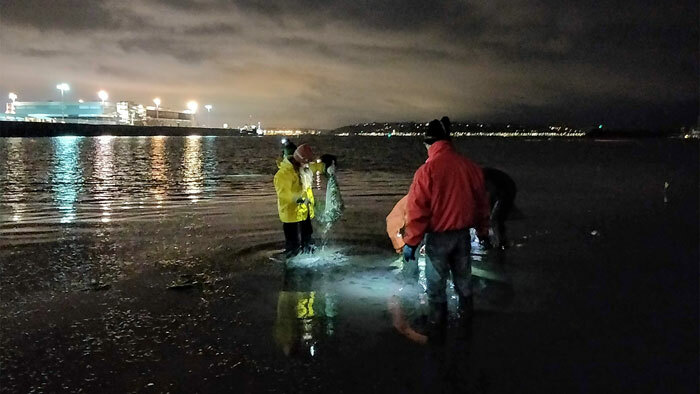 That program received media attention back in May after the mussels tested positive for opioids and other pharmaceutical drugs being flushed into Elliott Bay. The Puget Sound Restoration Fund and DNR are expected to provide a long-term study of the Blue Carbon Pilot Project at a date to be determined. Sloan said aspects of the project that will be studied are survivability, growth and chemical quality. Once project benefits are confirmed, the pilot can be replicated in other parts of the Sound. There is no developed public access to the part of the bay where the oysters were seeded, and people wouldn’t want to eat them due to the sequestered contaminants, Sloan said. Warning and interpretive signs will be installed nearby either in late winter or early spring, he said. Shellfish and kelp biomass will be collected and turned into compost, which will be tested in Centennial Park. Sloan said raised beds will be used, so the marine-based compost can be tested next to traditional compost.